Heeeeeeyyyy! It's August already?! Where did the summer go?! I'm finally recovering from eating cheese and cake for a whole week. Aren't birthdays great? I don't know if I could have asked for a better birthday week. Having the Cho Family close by would have been nice! Despite some minor homesickness, years 26 and 30 are starting out pretty great. There was the aforementioned cake and cheese, seeing and hearing from friends around the globe, and guess what?! Reuben finally passed ALL his architecture exams!!!!!!!!!!!!!! I think that deserves another cake right? 😁 I'm so freaking proud of him. He knocked out all 7 tests (without failing a single one) in 1 year. That man is dedicated. I also like to think I played a hand in this by supporting him with study snacks. I think in a few weeks he's going to technically be a real licensed architect in Pennsylvania and get a fancy stamp. Woooo! His craft beer intake has spiked a little... you should see how beautiful our recycling bin is. How great of a birthday present is having your best friend in town?! Katie flew in from Seattle for our birthday picnic and I wish she stayed forever. It was so great to have her in town to catch up on life, discuss how great groomsmaids/best-humans we are going to be for Jeff next May, figure out what our dog breed look-a-like is (Reuben is a sheep dog), and just run around being silly. She also made an awesome kitchen assistant and guest photographer. 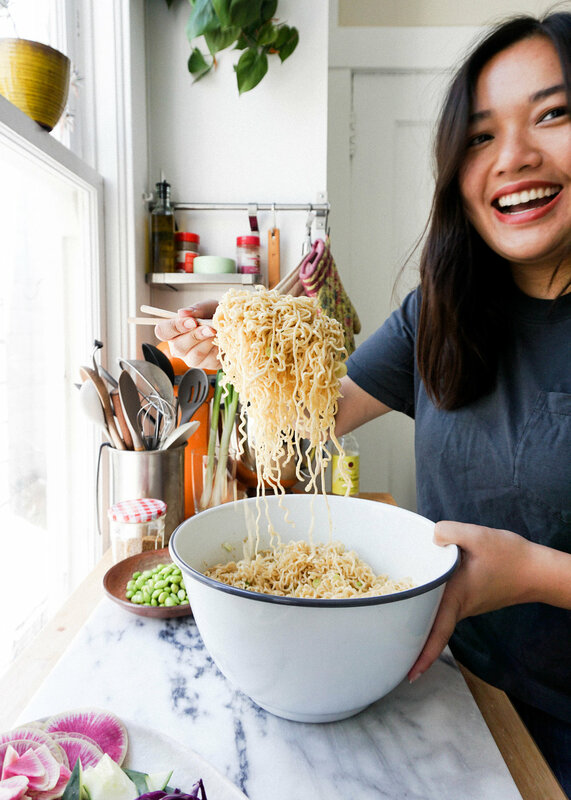 Working on these recipes can get pretty lonely, other than the occasional visit from Reuben to steal bites of food or when I royally screw up something and need his advice. She helped me make this INCREDIBLE CAKE (more about it soon) and assemble my first legit cheese board. We lounged on picnic blankets in the fog snacking on fruit, eating multiple small slices of cake, and chatting with all the characters we know in SF. The next day we drove down south to Pescadero Beach to be really Californian. It was so hot and sunny! I'm not used to that. We wandered around the tide pools and looked for agates, of course. I feel like I forget that I live in California until I go to the beach. We also went to go see a giant redwood tree as old as Jesus. Miss you Katie! I'm going to talk about this cheese board for a hot sec. I've always wanted to put together a gorgeous and bountiful cheese board. It turns out that it is actually pretty easy if you have access to some beautiful fruit. My cheese board is pretty fruit heavy, which is how I like it. Color is super important to me, so we were trying to pick out fruit that complimented each other. Color Theory! I also like to have a mix of cheeses, something hard (asiago), something soft and creamy (goat brie), something mild (gouda), and something funky (blue cheese... even though I hate blue cheese). You gotta hit all the notes. I thought that the board turned out pretty beautiful, if I do say so myself 😎. Someone else thought it was pretty beautiful too, because I was asked to make a cheese board for another birthday party! My very first commissioned cheese board! I'm thinking of making #chocheeseboard a thing. If you're in the Bay Area and need fancy cheese and crackers for an event, hit me up! Alright, cake. A few weeks ago when I posted the Black Sesame Plum Crumb Cake, I said that this may have been the best thing I have ever baked. That cake is pretty damn good, but this cake is amazing. I blame it on the cream cheese frosting. Idk if I could trust anyone who doesn't love cream cheese frosting. We may or may not have continued licking the bowl post assembly... This recipe was adapted from Smitten Kitchen's Best Birthday Cake recipe. I love her recipe and pretty much always gravitates towards it when I need a great yellow cake. I reduced the sugar by half and made an addition of honey for flavor. You could easily make this into a layer cake or even cupcakes, but I think I have fallen in love with sheet cakes. They are so easy! Less mess, no crumb coats, they feed a ton of people, and still look equally as pretty! Actually, I've always loved sheet cakes. My parents would always get us a big sheet cake from Giant Eagle for our birthdays growing up and they were the BEST. Northern Ohioans and Western Pennsylvanians will agree with me. So many people loved this cake at the picnic. If you have a birthday coming up or a celebration in need of cake, I highly recommend you make this. Everyone is going to love you and you're going to be so happy! I'm actually making this cake again today for a dinner party per a special request! 1. Preheat your oven to 350 degrees. Prepare 9" x 13" sheet pan with non-stick spray and line with parchment paper. Set aside. 2. Whisk together cake flour, baking powder, baking soda, and salt in a medium bowl. 3. In the bowl of your stand mixer, beat together butter and sugar on medium speed until light and fluffy, about 1-2 minutes. Add in vanilla and honey, mix for a few more seconds. Add your eggs one at a time and beat until incorporated each time. Reduce the speed to low and add in the buttermilk. The batter will look curdled and gross, but don't freak out! Everything is going to be okay. Gradually add your flour mixture in batches. Mix until evenly incorporated. Scrape down the sides as needed. 4. Pour the batter into your prepared cake pan and spread evenly with an offset spatula. To get rid of any air bubbles, drop the pan about 2" above the counter a few times. 5. Bake for 35-40 minutes, until golden brown and the center comes out clean when poked with a tooth pick. 6. Once done, allow to cook in the pan for 10 minutes, then remove cake from the pan and allow to completely cool on a wire rack. 7. While the cake bakes or while it cools, make your cream cheese frosting. Beat together butter and cream cheese until light and fluffy, about 30-45 seconds. Gradually add powdered sugar and beat for another 1-2 minutes. Add vanilla and a pinch of salt and mix for another minute. The frosting will be a little loose, so place in fridge for 30 minutes to allow frosting to set up. 8. 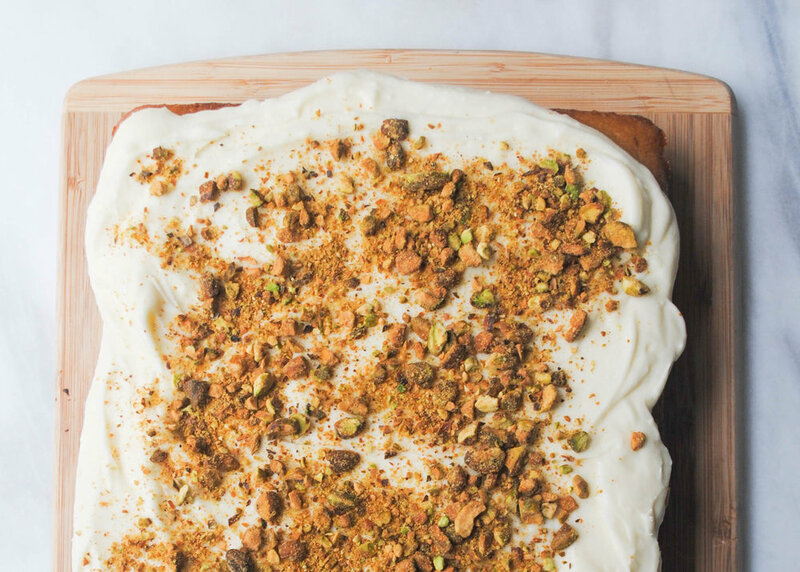 Frost cake with a thick layer of frosting and top with crushed pistachios. Or sprinkles! Or whatever your heart desires!